The cooling system, made up of parts that include the radiator, cooling fan, thermostat, water pump and a series of hoses, has an incredibly important job. It is tasked with regulating the operating temperature of the engine to ensure that it does melt itself. If any part of the cooling system were to fail your car's engine temp would skyrocketing, putting the vehicle on a path of destruction. If you notice any of these signs of cooling system trouble call your auto shop ASAP. The first thing that you may notice if the cooling system is having trouble operating is the dashboard engine temperature gauge rising into the redzone. If this happens to your car be sure to pull over as soon as possible so that you can let your car cool down. Contact a mechanic for further instruction based on your specific scenario. If you missed the temperature gauge rising then the next thing you will likely encounter is white steam pouring out from under the hood. This is a sure sign of overheating, so it is imperative you turn your car off as soon as possible. 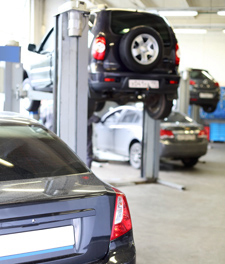 There is a good chance that your car will need an immediate trip to the auto shop. From time to time be sure to check your car's fluid levels, including the coolant. If you find that your vehicle's coolant level is low there is a good chance that you will also experience one of the following two issues. Have you noticed your car producing excessive amounts of white exhaust smoke? This could be a sign that coolant is leaking into the combustion chamber of your vehicle. This is a major issue that requires immediate service. Of course, if you spot a puddle of bright green, sweet smelling liquid on the ground under your car, you have just discovered a coolant leak. Low levels of coolant are a top contributor to overheating issues, so be sure to visit the auto shop to have the leak location identified and repaired. Overheating can cause major engine damage, so it is important that you always allow services to be done right away if you believe the cooling system is having trouble. To schedule professional cooling system and radiator repair in Asheville call The Organic Mechanic at (828) 232-8120. Our team of expert auto repair techs will take great care of your car, no matter what you drive. Our Asheville auto repair shop services all makes and models, and we are happy to offer a warranty for most parts and labor.